The multi-week view is a customizable alternative to the standard monthly calendar display. You can set the number of weeks to display in the multi-week view. Go to Settings > Calendar Views, then choose from 1 to 12 weeks. You can change the number of weeks displayed at any time. 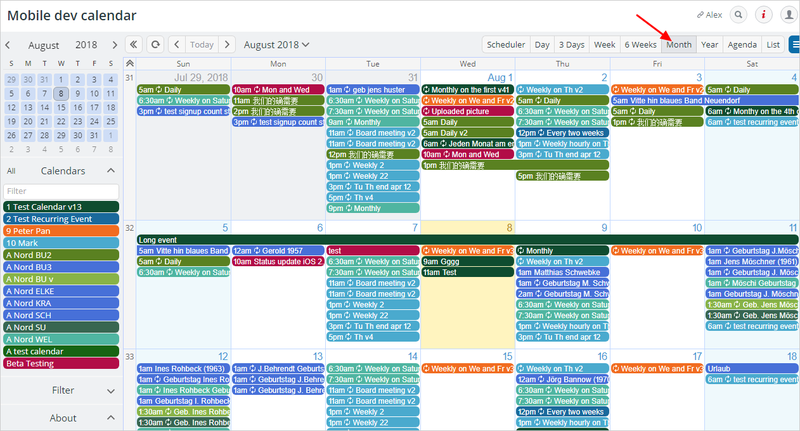 The multi-week view offers several advantages for calendar use. The standard month calendar view displays events of the current month, from the first to the last day of the month. If the current date is toward the end of the month, then, your calendar view will show mostly past events. To have the view of a month (or more) at a time, while keeping current and future events displayed, use the multi-week view: It displays the designated number of weeks, with the current week always in the first row. 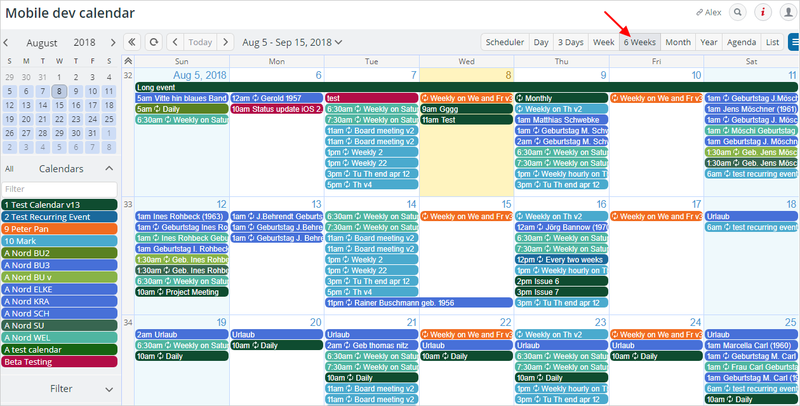 With the multi-week view, your calendar display stays current automatically. If you are a calendar administrator, consider setting the 4-week view as the default instead of the month view, if future events are more important to your users. The default calendar view can be configured in Settings > Calendar Views. If the current date is toward the end of the month, the month calendar view will display mostly past events. The multi-week view always shows the current week in the top row, keeping your calendar focused on current and future events. The number of events that can be displayed in the daily blocks of the month and multi-week views depends on the browser window size. When there are many events on a particular date, the calendar may only display the first few events, as screen space allows. Calendar link parameters are key=value pairs which you can add to the end of a calendar link, for a customized view. You can append ?view=mw# and replace the “#” with the number of weeks desired in the multi-week view. Doing so will force the calendar to be displayed in a multi-week view with the number of weeks chosen. For example, ?view=mw3 will force the calendar to open in a three-week view. This is a helpful option when different user groups have different needs for viewing blocks of time, e.g., an operations engineer may prefer a 2-week view, while an 8-week view is more suitable for a sales director. Read more about appending calendar parameters here. Put your browser into full screen mode. Zoom out by pressing CONTROL – on a Windows PC, or COMMAND – on a Mac. Collapse the left hand control panel. This can create more space. Try the List or Agenda views. These could be an alternative if a very large number of events needs to be displayed. View the calendar on a larger screen if possible. Hide the weekends to create more space for the weekday blocks. Do this in Settings > Calendar Views. Hiding the weekends allows for more horizontal space, which allows longer event titles to be displayed. When printing the multi-week view (and all other grid views), the printout is limited to one page with equally divided rows. If space on the printout allows, events that are hidden on your on-screen calendar display may be visible on your printout. It’s worth experimenting; try printing in Portrait with a 2 or 3 week view. Please note that when printing from the List or the Agenda views, Teamup Calendar supports the printing of multiple pages and all events will be printed out. Read more about printing a Teamup Calendar here.